What Are Fennel Seeds Good For? A perennial herb with yellow flowers and feathery leaves, fennel is native to the shores of the Mediterranean Sea, but it grows in dry soils in many parts of the world. Fennel seeds contain chemicals, such as anethole, camphor, quercetin and polymers, that act as plant estrogens. Nutrients in fennel seeds include amino acids, calcium, choline, essential fatty acids, iron, magnesium, manganese, phosphorus, potassium, selenium, thiamine, niacin, riboflavin and vitamins C and E. Fennel seeds are not approved by the Food and Drug Administration for the prevention or treatment of any conditions. Fennel seeds may help prevent the formation of gas and facilitate the expulsion of flatulence in the digestive tract by relaxing the intestines. You can chew the seeds to relieve bloating. Consult a healthcare professional if symptoms persist. Bruise the seeds and add hot water to make fennel tea, a traditional remedy for infant colic. Researchers from the St. Petersburg State Medical Academy in Russia gave 125 colicky 2- to 12-week-old babies either fennel seed oil or a placebo. The oil eliminated colic in 65 percent of infants, with no reported side effects. The study was published in the July-August 2003 issue of "Alternative Therapies in Health and Medicine." 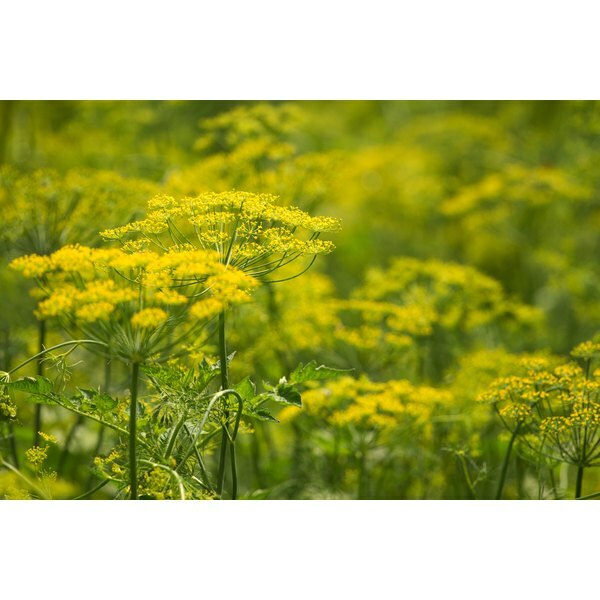 Take advantage of the estrogenic effects of fennel seed to enhance breast function. Lactation consultant Shiela Humphrey, author of "The Nursing Mother's Herbal," writes that when breast-feeding, a mother can drink fennel seed tea to increase her milk supply, while simultaneously soothing her infant's digestion. Humphrey warns that fennel seed may cause a stronger letdown, however. Some nursing infants may swallow rapidly when the milk flows too fast and wind up taking in more air. Breast-feeding mothers should consult a healthcare professional before using herbal remedies. Make an eyewash by boiling fennel seeds. This traditional herbal medicine is used to treat pink eye. Fennel seeds have not been proven to prevent or treat any disease and should not be a substitute for regular medical care. Researchers in New Delhi, India, investigated the possibility that fennel seed extract can help treat glaucoma. Using steroids and fluids to induce glaucoma in rabbits, the scientists found that a single drop of the remedy reduced intraocular pressure by more than 30 percent. The study, published in the January-March 2008 issue of the "Indian Journal of Physiology and Pharmacology," called for further research and clinical trials on fennel seed extract as a potential glaucoma treatment. Fennel seeds help promote the functioning of the kidneys, according to nutritionist Phyllis Balch, author of "Prescription for Nutritional Healing." If you have hypertension, this diuretic effect may help lower blood pressure. Consult your doctor, however, before using any natural remedy. Scientists from the Unilever Food and Health Research Institute in The Netherlands reviewed studies of herbal medicines to identify those that increase the kidney's excretion of urine and sodium, actions that are associated with diuretic medications for high blood pressure. The article, published in the October 2007 issue of the "Journal of Ethnopharmacology," cited fennel seeds as one of the most promising folk treatments.